Drawing on a range of new releases and old favorites, Strange Currency covers broad swaths of musical terrain. From progressive rock to dark synthwave to singer-songwriters, the goal is to give the listener a sense of the familiar while introducing them to songs they didn't know they loved. The show airs six nights a week and is available throughout the year as a one-hour or two-hour show. Strange Currency features classic and emerging artists in a forum that is ever evolving and curated by the show’s host, based on the host’s taste, and a reflection of the host’s personality. More than merely a music show, it’s conversation piece that consistently leaves listeners scrambling for playlists and their iTunes account. The material ranges from classic alternative artists to blues-rock, to progressive and post rock with a special ear toward forgotten or underappreciated artists. This is the sound of a friend welcoming you into their home for a night of deep listening and light conversation. 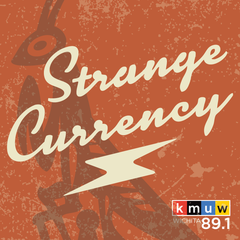 Strange Currency has been heard on KMUW’s FM stream since 2009. Our audience ranges from teens to retirees, from music fans to musicians themselves. The two hour show is available six nights a week with five shows that air at 57 minutes and one at 59. 57 minute shows have floating breaks, the 59 minute show runs continuous. The show is stream-able and SoundExchange compliant. Additional promotional material is available. Jedd Beaudoin is an award-winning writer and broadcaster with a wide range of musical interests. He has served as a local music critic in Wichita, Kansas since 2003 and his written work has appeared in a variety of music publications, including No Depression, Copper Press, Amazon.com (where he served as an editorial critic), and, currently, at PopMatters, where he contributes to the Kickin’ Up Dust column on a bi-monthly basis. He also serves as host of Wichita Sessions, a syndicated live music television program.